Ryan began his career with Connors Wealth Management in the summer of 2017 as a research investment intern, where he greatly impressed the team through his hard work and initiative. 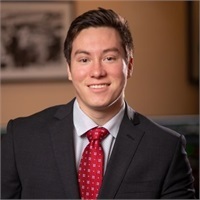 After completing his degree in finance from the University of Central Florida (UCF) in 2018, Ryan joined the firm as an advisor assistant. Originally from Viera, Ryan appreciates the ability to give back to his local community by contributing to the high standard of community service provided to Connors Wealth clients. His focus on the wealth planning team will be to help draw in millennial and Gen-X clients. When he is not working hard in the office, Ryan enjoys wake-boarding here on the beautiful Brevard County beaches and spending time with his girlfriend. What's on Ryan’s Bucket List: To travel to all 50 states and attend an English Premier League soccer game in person. If Ryan could meet anyone past or present, it would be: Warren Buffet; he is the humblest genius the world has ever seen, and I would love to sit down and speak with him.